Interview with the artist collective fighting Serbian censorship. Serbia sits a fork in the road. One path leads to the European Union, the other Russia. 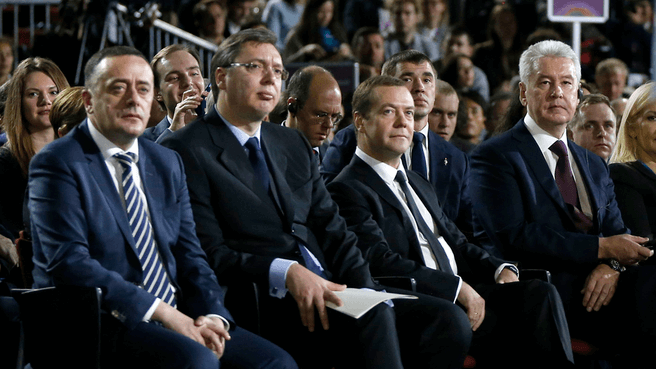 Since the fall of the Milošević regime in the Bulldozer Revolution of 2000, Serbia has leaned towards the EU. However, the Serbian government has refused to make a firm decision one way or the other and today the country seems to be heading towards a Russian inspired illiberal democracy. In the last year, Serbia has dropped seven places in the Press Freedom Rankings compiled by the NGO Reporters without Borders. They specifically cite the current President Aleksandar Vučić as being behind Serbia’s falling score with “media work under harsh financial and editorial pressure, and those that are most critical of the government are attacked publicly.” Under Vučić, critics have been replaced by loyalists in public media outlets and dissent is seen a treason. Tabloids routinely run embarrassing articles about those opposed to the government and drag critics through the mud. On October 20th, artists and opposition activists from the Salon of the Unbribables protested declining press freedom in Serbia outside of the grand reopening of Belgrad’s Museum of Contemporary Art. 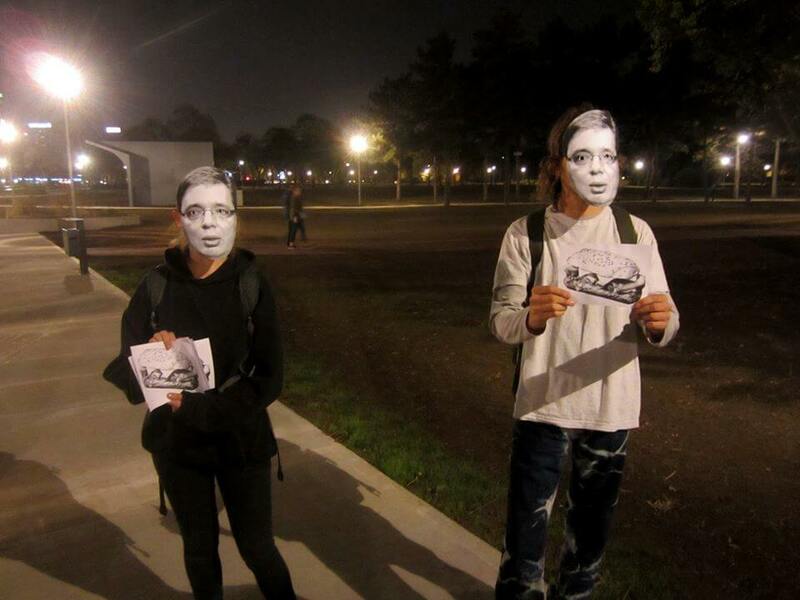 The protest involved artists wearing Vučić’s face as a mask, handing out pictures of sandwiches, and rallying around the slogan “We don’t want a society of clones.” The protest was meant to mimic how Serbia’s ruling party feeds its supporters in exchange for ideological uniformy. At the end of the performance, two artists were detained first by security and then by police under the charge of insulting a state official. The artists were eventually released and agreed to share their story and mission with Political Critique. What is the Salon of the Unbribables, what is its goal, and how did it get started? Vladan, Rena, Tony: We created The Salon of the Unbribables to break the silence about the state of art in Serbia and the region. We organized an exhibition to explore how to be “unbribable” in an environment where everything and everybody has a price. We are talking primarily about the production of arts here, where the majority of artists see the placement of their pieces on the art market as the only goal. We also wanted to tackle the socioeconomic and political issues that created such an art scene. So we invited artists to criticize the ruling party’s ideology which has eroded society’s core values over the last decade; a process that has intensified during the rule of the current government. In that sense, Serbia is not an exception and we have to connect it to the larger international cultural struggle by acknowledging the problem as a global issue. We hope to inspire other artists and activists, to create awareness, and to let people know they are not alone. What brought the Salon to demonstrate in front of the Museum during its reopening and what was the message behind the clones? 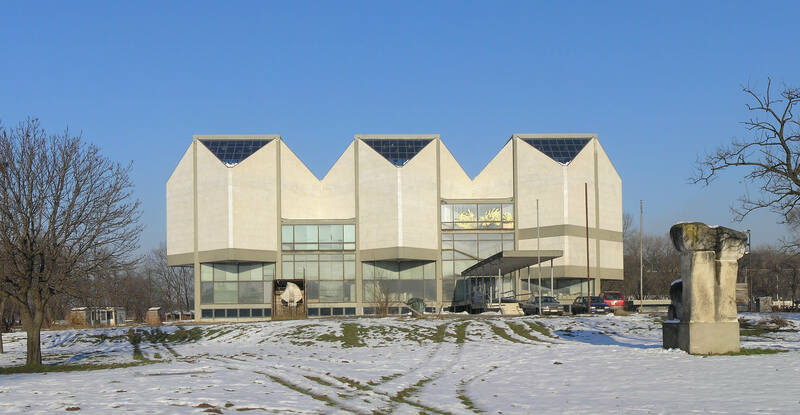 After the fall of Milosevic in 2000, the Museum of Contemporary Art in Belgrade was handed over to the opposition, mostly young people working at the Center for Contemporary Art. During that period, the museum had controversies, but it was more open and critical. 10 years ago, the first director started an ambitious reconstruction project which she never finished and the authorities still have not explained. Several incompetent directors have been in charge since then and none were capable of finishing. Currently, the museum only has an acting director basically just an administrator. He has no expertise, connections or affinity with contemporary art. Nevertheless, he managed to complete the reconstruction this year. The museum has the potential to become a platform for a progressive image of Serbia in Europe and the world. But instead, the government is using it to silence criticism about the actual effects of their social, economical, and cultural policies through the declarative integration of liberal values. The Cultural Strategy of the Country, recently proposed by the Cultural Ministry, includes a list of criteria that define Serbian culture rooted in folklore, national myths, and national hardship, and requires it to be defended from globalization. In almost every detail of the program, the integration of liberal values (cultural tolerance, democracy,…) legitimizes a highly problematic understanding of Serbian national culture. With such a program, the cultural strategy fosters backwardness and re-traditionalization of the population, while economic policies of the government support the opening of the market to global investors, who are looking for cheap manual labor and low taxes. The idea of clones is connected to all those forces and this mix of liberal and patriotic values. Clones are constantly repeating and reproducing, cementing the power of policymakers and the ruling party. Can you explain how the art scene in Serbia has changed since you’ve been involved? What has changed since Vučić became president in 2017? In 2000, the art scene was quite diverse, and there existed structures that raised social and political questions. Quite interesting events happened like the Queer Belgrade Festival or stuff run by slobodnakultura.org, which we co-organzied. This was possible because there were many ways to get smaller funding for various cultural activities, exhibitions, publishing etc. either from the ministry, the city, or a number of special funds for culture from abroad, or even organizing things without any financial support. Small initiatives worked together to bring things forward and it was quite an optimistic time. Around 2010, commercialization of the cultural scene began with the Democratic Party using the creative industries to trigger gentrification in the Belgrade, through design projects. Since then, Serbia has become partly eligible for cultural EU funds, and other funding bodies have withdrawn. Today only bigger organizations or institutions are eligible to apply for these programs. People from the political art scene reoriented themselves, e.g. started to do media work or design, others left the country, and found themselves in quite precarious positions. With Vučić regime, directors in the cultural institutions were gradually replaced with loyalists, most of whom have absolutely no relation to culture. With the early elections for president, he secured power for the next four years and let a technocrat, Ana Brnabic take his place as Prime Minister of the country. Do you feel that Serbia is unique in its situation or are your colleagues in other Balkan countries experiencing similar problems? Serbia is not in a unique situation. What is happening here, is part of a political trend in Europe and the US. Serbian politicians admire Victor Orbán and his policies, how Orbán promotes himself and play independently within the EU or how he introduced limitation to foreign banks. Like in other CEE countries, previously critical people are leaving institutions or have left the country already. If they stay, they often switch to the private sector, where they try to survive under market conditions. Our impression is that in Poland you have a very strong Catholic Church, which does not exist in Serbian orthodoxy on such an organized level, which makes the situation in Poland even more complicated. Additional, in Poland left-wing parties like Razem, have emerged in response to this the rise in right-wing politics, while it hasn’t happened in Serbia. A small group of people linked to the government are enriching themselves beyond imagination, while criticism remains absent due to self-censorship. The Serbian right-wing government is extremely neo-liberal and increasingly authoritarian, with solid support from the US, the EU, and Russia. Even the Turkish president Erdogan supports Vučić! The worst consequences of this regime are its austerity measures and privatization schemes which in addition to a progressively increased unemployment rate and de-industrialization, have made the country insoluble. Serbia is now importing everything and is suffering from a huge deficit. In that toxic surrounding, the Left urgently needs to unite across Europe, and stand together in solidarity. Only joint trans-national connectivity will increase our chances to move forward. In your own words can you walk me through what happened the day of your arrest? Is it common for police to arrest someone for insulting the president? On the October 20th, we organized in front of the museum to perform on the newly built pathway between the Usce Shopping Mall and the museum. Visitors and guests coming to the opening were invited to wear a paper mask with an image resembling Serbia’s president Aleksandar Vučić while handing out leaflets with only an image of a sandwich printed on it. The demonstration lasted about 10 minutes and was positively received by most of the public. After the performance ended, at the entrance to the museum, security checked the bags of one of the visitors, who still had some props of the performance in her hands. She was given over to the police for an identity check. Vladan came to the scene to explain that he was one of the organizers of the performance, but was immediately given over to the police. Police officers checked his identity, took the invitation leaflets to the Salon of the Unbribables and papers with printed sandwiches and told him that they had to bring him to the police station for interrogation. Next, to the arrested artist and the police ambassadors, curators and the cultural elite of Serbia were passing by in a hurry to get to the VIP cocktail party at the restaurant “Top of the Hub” where the superstars of Serbian politics and show business were expected to appear. Among them were the curators of the Museum of Contemporary Art, Zoran Erić and Dejan Sretenović, who explained to the police that Vladan is an artist, that it was an artistic performance, and that they should let him go. Still, the police insisted and – because of the mask and flyers – he was brought to police station. About half an hour later, Uroš Jovanović, an independent artist and performer, was arrested when he tried to enter the museum with a giant golden framed photograph of the Serbian president with the statement: “Vučić – the best artist.” Both, police and private security, accused the artists of “insulting a state official”. The state prosecutor decided to let both go after several hours of interrogation. A few months ago, the image of the president indeed was discussed, when Minister of Defense Vulin and Minister of Education Šarčević proposed to put up his picture in public institutions and schools. The proposal was welcomed by Prime Minister Brnabić because, as she said, the cult of national symbols should be strengthened. According to testimonies of several visitors, it was not only the ‘image’ of the president that seemed to pose a threat to certain norms. Three young artists, Jelena Jaćimović, Sofija Modošanov and Tanja Todorović who stayed for 7 days in the museum, stated in a radio interview at Radioaparat.com that: “blank sheets of paper seemed to be the biggest threat for the museum.” People who wanted to visit them were searched for drawings and paper in their bags and a restriction on visiting friends and colleagues was introduced without their knowledge. Private security told them that ‘political connotations’ were not allowed to be brought into the museum space. A curator from Denmark, Parl Kristian Bjørn Vester, reported that security took out a doodle from a book he carried with him and threw it away. It is common in Serbia that private security or ruffians are hired as an additional force during demonstrations, and public events involving high-rank politicians. There have been several cases of attacks on journalists from critical media by hired security persons during such events. What was the wider response to your arrest by the Serbian artistic community? The most important response came from the Association for an Independent Cultural Scene in Serbia (NKSS) which strongly condemned the arrest saying : “Given the fact that these were announced artistic actions that were non-violent, nor did they endanger anyone, it is obvious that this is a typical case of censorship, and that this took place in front of an institution that should be the pillar of freedom of expression and respect for contemporary art, which implies a critical attitude towards different social appearances and phenomena” and “if private security and the police want to express their critical judgment or take on the role of the curator, they should announce it, and explain how they include the arrest of an artist in their curatorial practice.” The NKSS also accused the MSUB of endorsing such police operations with their silence. At the same time, the NKSS called on the professional and wider public to sharply condemn the restrictions on freedom of expression and to support the artists. You talk a lot about self-censorship, where do you feel that this comes from and why is it so strong? We believe the Unbribables will soon be stigmatized by the controlled media, and thus their position in society will be intentionally weakened. The way the current authorities control all forms of information and communication creates a climate of fear, apathy, and self-censorship. The majority of the population are extremely afraid of losing their jobs, their position in society, or ultimately their livelihoods. These are fears utilized by the government to suppress dissent and force votes in their favor. This explains the skewed results which support the ruling party. They cement and consolidate their position by deconstructing democratic processes gradually turning into a totalitarian autocracy, with Alexander Vučić at the helm. They utilize the media to defend their actions as democratic, liberal, and as complying with constitutional laws. The EU allows this to happen, in exchange for industrial, military and economic benefits. The Serbian government in return buys itself international immunity. They clearly have been kept in power because of international interests and support. The effect inside Serbia is detrimental. A small group of people linked to the government is enriching themselves beyond imagination, while criticism remains absent due to self-censorship. In the cultural sector, funding has declined in the last decade and the fear of losing the last source that remains creates apathy and silence. This again is published and promoted as approval, completing the vicious circle of self-censorship. Rena Rädle & Vladan Jeremić are Belgrade-based artists whose joint artistic practice explores the overlapping space between art and politics. They have worked with groups such as the Chto Delat?, ArtLeaks, Perpetuum Mobilε, SIZ , ZIP group, LevArt and other collectives. They are the founders of the Unbribables together with Tony Maslić and Nikola Radivojević. Tony Maslić has been working in a multitude of media, executed usually in cross-disciplinary installations and/or film. Throughout his work he has explored the relationship of space with politics, urbanism, social economics, psychology, pre- and post war social conflicts, social and cultural displacements, violence, propaganda & populism, group dynamics/behavior, cultural identity and the effects of capitalism.